If you offered me fifteen minutes to share what’s at the heart of my belief as a Christian and how that shapes my understanding of education, I think this is the best answer I could give. It’s the text of the convocation address I delivered yesterday in the opening chapel of the 2015-2016 academic year at Bethel University. Thanks to Laurel Bunker, Deb Sullivan-Trainor, and Marie Wisner for giving me those fifteen minutes. Grace to you and peace from our Lord, Jesus Christ. And on behalf of all who work here, welcome — or welcome back — to Bethel University! You’ve heard that greeting many times already in recent days, but truly, it is well that you have come to this place and joined this community. May we bless you as you will undoubtedly bless us. This week in Chapel you’ll be hearing a lot about the theme “One body, many parts.” Especially in a time when the church can seem as divided and polarized as the larger society, this is a hugely important idea, one that the apostle Paul writes about in 1 Corinthians 12. Today I just want to get us started by reflecting on one phrase in one verse of that extended passage: “Now you are the body of Christ and individually members of it” (1 Cor 12:27, NRSV). If we at Bethel, if we the Church are in some way the figurative, metaphorical body of Christ, then I want to suggest that we are also in some way similar to the literal, historical body of Jesus the Christ. So let’s think about what the Bible tells us about that one body, and what it means for our larger Body. First, the body of Jesus the Christ was incarnate. That’s just another way of saying what we read in John 1: “…the Word became flesh and lived among us” (v 14a). The son of God, “light from light, true God from true God,” actually had an honest-to-goodness, flesh-and-blood human body. What does that mean for us, the body of Christ gathered at Bethel University? First, that we should recenter ourselves. Jesus not only lived at a certain time in a certain place; he looked a certain way. The body of Jesus, an Afro-Asiatic Jew, had skin much darker than mine — much like the vast majority of the human bodies that now make up the larger Body of Christ. Early in the 21st century, the average member of this Body is not a white guy in Minnesota; she’s a black woman in Nigeria. We at Bethel are part of a global movement of the Holy Spirit, and nowhere near the most vital part of it. But while Jesus’ body had a particular appearance, and he spoke a particular language and followed particular cultural customs, his incarnate body was fundamentally similar to every other human body. So a second takeaway here: we ought to study anything related to being human. When you take courses on child development, you’re studying a process that Jesus went through. When you take courses on physiology, you’re studying principles that could be observed in Jesus. When you study history, you’re studying time and space, the stuff that Jesus inhabited. When you study economics or political science or sociology, you’re studying human systems like those that Jesus participated in — and often critiqued. “All things came into being through” this Word that became flesh, the gospel says, “and without him, not one thing came into being” (John 1:3). If you study anything in Creation — math or music, business or biochemistry — you are studying something connected to the body of Jesus Christ. Then third, some practical advice: incarnate bodies need to be healthy, in every respect. The body of Jesus required physical sustenance: he ate and drank and slept. So you, the body of Christ, take care of your physical body; now that you have far more freedom than you’ve ever had in your life, take care the choices you make with your diet, your schedule, your physical well-being. Then remember that the body of Jesus also included a mind that required intellectual sustenance: he studied Scripture and had lively conversations about theology, ethics, and politics. Do likewise! Don’t limit the life of your mind to the relatively few hours you spend in class or doing homework. And finally, attend to the spirit that animates your body; like Jesus, renew yourself with times of silence and prayer, meditation and worship. So first, the body of Jesus the Christ was incarnate. But second, it was crucified. 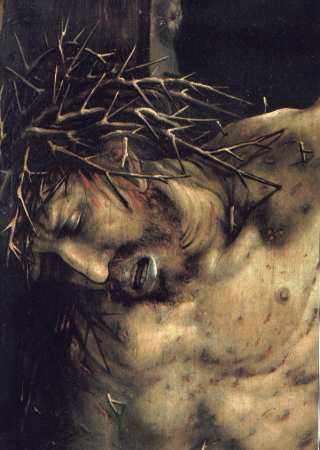 It experienced terrible pain and suffering as a result of human sin. And the body of Christ does still. Today, in 2015, the body of Christ suffers as its members around the world are murdered, imprisoned, and forced from their homes. Today the body of Christ suffers as millions upon millions of its members eke out an existence on less than a dollar a day — susceptible to diseases with cures, walking miles for clean water made more scarce by the warming and polluting of this planet. Today the body of Christ suffers as children’s lives are snuffed out before they’re born and as other children enter a world of profound inequality. Today the body of Christ suffers as black churches are burned, black teenagers are shot, and black men and women are incarcerated at appalling rates. And today, in 2015, the body of Christ suffers as its gay, lesbian, and transgender members are ostracized, demonized, and even driven to suicide. So if we are the body of Christ, we are wounded — we should feel pain, empathy, and righteous anger. This isn’t easy to hear, but you should expect this of your Bethel education: that it break your heart for the things that break God’s heart, and that it urge you and equip you to seek the peace, righteousness, and justice that make up God’s shalom. But still more troubling, your time at Bethel should convince you of this: you, the body of Christ, are both crucified and crucifying. If pain and suffering afflict the world, it’s at least partly of Christian making. It’s not a truth that most Christians want to accept, which is one reason why Jesuits like Pope Francis go through an intense series of Spiritual Exercises, developed almost five hundred years ago by their founder, Ignatius Loyola. In one of them, Jesuits imagine themselves at the foot of the Cross, staring up at the battered, bloodied, pain-wracked body of Jesus. Prompted by their spiritual director, they consider how they, in their own sinfulness, brought their Lord to that point and contributed to his suffering. In a way, a Christian liberal arts education ought to be something like this Ignatian exercise, convicting us of how we, the body of Christ, extend the crucifixion into our own time. For example, this November students in my Modern Europe course will imagine themselves walking into a forest in Poland in 1942. They will imagine themselves at least nominally Christian German soldiers who forced elderly Jews to the ground and blew their brains out — the “ordinary men” of Christopher Browning’s book who used the same rifles to force ten thousand more Jews onto trains bound for Treblinka and extermination. My students will have to consider whether they are really all that different from those perpetrators of the Shoah, or from the millions more who stood by and let it happen. In short, we will confess our sins: what we have done, and what we have left undone, that drives thorn after thorn and nail after nail into the body of Christ. So while the Incarnation calls us to study humanity and every other part of Creation, the Crucifixion calls us not to do that work dispassionately, at a distance: but to convict us of our own shortcomings and to confront us with the systemic evils that we enable. If you’re listening, you should be bothered, at least a bit frightened — not quite sure that this is what you signed up for when you mailed in your application. And yet, we’re told that “God did not give us a spirit of cowardice, but rather a spirit of power and of love and of self-discipline” (2 Tim 1:7). We enter these studies, begin this year, not as a people of fear, but as a people of hope. For the body of Jesus the Christ is not just incarnate and not just crucified. It is resurrected. What other religion would or could liken its community to a body? To say that “you are the body of” anyone else, two thousand years after their birth, would evoke death and decay. If the story of Jesus ended at the Cross, saying that we are his body would bring to mind dry bones sealed in a stony tomb. But when Paul tells you that you are part of the body of Christ, he evokes life in its most impossible abundance. Do you believe it? That the tomb is empty, the stone rolled away? That the irreversible has been reversed? That in death yet there is life? Do you believe it? If not, says Paul, our preaching is useless and so is our faith (1 Cor 15:14). For this is the center of the Christian story: not the Fall, not the Atonement, not some Rapture… Resurrection. So I ask a third time, do you believe it? And more importantly: do you live differently because you believe it? Do you live as a member of the body of a resurrected Christ? Or are you like the disciples? At the end of John’s account of the Resurrection, Mary Magdalene reports back to them that the Christ is risen, that she has seen the living body of Jesus. Yet the next verse — the next verse! — it’s a few hours later and the disciples have got the doors locked “for fear of the Jewish leaders” (John 20:19). Jesus comes and tells them “Peace be with you” — and he speaks the same words to us, over and over — but do we believe it? Or do we live in fear of a death that has already been defeated, a death that Paul testifies will be swallowed up (1 Cor 15:54)? Now, death is real. And it’s unjust, cruel, and rapacious. My primary field of history is the 20th century, in which wars, genocides, reigns of terror, and human-instigated ecological catastrophes extinguished nearly 200 million lives. Death is real. We’re experiencing it in our community: one of our colleagues died of cancer this summer; other friends on and off this stage are battling the same disease. The most reasonable response to such a precarious existence is fear. But there is nothing reasonable about the resurrection, and so we hope against hope. Late in the 17th century, Pietism was born in the wreckage of the Thirty Years War: the most devastating conflict to that point in history, killing one in four Germans through combat, pillaging, famine, and disease. Yet from the beginning, Pietists have always called Christians to live in “hope for better times,” attentive to the ways that God is renewing the church and, through it, the world. So I challenge you: live in Jesus Christ’s future. Live in active expectation: not ignoring the problems of this time, but confident that the Resurrection disrupts all patterns, makes all things possible — including triumph over the power of death itself. That is good news, amen? Not just good news, but the best news. Because it doesn’t just mean that we get to go to heaven. Nothing so small. It means that the God of the Resurrection is a God who delights in making all things new: new creation, new birth, new life, new covenant… Scripture teaches that God is bringing about “a new heaven and a new earth,” that he will be with his people, that he “will wipe every tear from their eyes. Death will be no more; mourning and crying and pain will be no more,” for he is “making all things new” (Rev 21:1-5). So as we begin a new year here at Bethel, the house of that God of the Resurrection, consider how we are being made new through everything that we do together, on and off this campus. We promise you a transformational education: expect it. Don’t be satisfied simply to acquire knowledge or enhance skills; don’t be satisfied getting a diploma that opens doors to a career. Expect to be changed; expect the liberal arts to be liberating arts, freeing you from prejudices and assumptions that lead to death and feeding a living faith made active in love. And this not for yourself: you were made for others. You are being made new in order to make new the Body of Christ, the Church. Ask it your hardest questions — demand better answers of institutions that are supposed to be “reformed and always reforming.” But then offer it your greatest gift: yourself. For when Paul says that “if anyone is in Christ, there is a new creation” (2 Cor 5:17), he means that you have been made new for the sake of the God who is sending you out as “ambassadors” for the risen Christ (v 20). For through all the parts of the Body of Christ working together, God is making the world itself new. Through a million million small acts by imperfect people like you who restore tiny corners of Creation. Through a billion billion instances of sinner-saints like you who scorn status and power and wealth to serve the same world that hates you. God is meeting the physical and spiritual needs of humanity through you, the Body of the Incarnate Christ. God is wiping tears from eyes through you, the Body of the Crucified Christ. God is making all things new through you, the Body of the Resurrected Christ. So how will you live this year: Will you live in fear? Will you live in the illusion that you are in control of your living, your learning, and your dying? Or will you follow Jesus Christ: into the darkness of this world, up to the foot of the Cross, and beyond it to the Empty Tomb? Will you live as a new creation, to the good of your neighbor and the glory of a God who is making all things new? Then do it, starting today: live as that Body of Christ. Amen.